Hi Everyone Its Deb here again with and update on our magnifying mirrors. Our full and new range of wall mounted lighted magnifying mirrors will land November 30 this year in time for Christmas. Onboard we have the wall mounted LED88C 8X LED lighted, the chrome wall mounted HL85 5x Direct wire model and sister 3x model to name a few. Within 2 weeks we'll place a pre order details on the site so you can have your goods sent automatically on arrival. 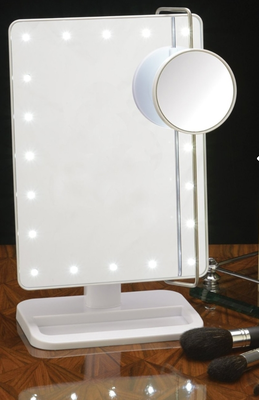 We will land the PS110 Lighted travel mirror in the next few weeks leaving you with a full range of models to choose from for Christmas. I always love a launch of a new model and the new Jerdon JS811W which has become available for the first time here in Australia is in a weeks' time. It is also timely to warn you when looking for a mirror online. There are many traps and it pays to call and ask advice. It's the reason we have our phone number displayed on the top of the front page so you can talk to someone who knows the products well. Our forte is our range and we spend a lot of time looking for practical and unique magnifying mirrors for every occasion. From home to travelling or just a handbag model they all unique and available here in Australia. Just cruising through the listings under magnifying mirrors online has mostly American listings. Even the eBay ad which has a .com.au signifying Australia has all American mirrors and most of them say not available in Australia. Received a call from another victim of Amazon during the week with the buyer calling to say she had one of our Jerdon mirrors and it wasn't working. It turned out she purchased through Amazon which send out only American 110 volt voltage mirrors. The plug was incorrect so she couldn't plug it in but she used a travel converter so she could plug in in with the result it blew up and caught fire. The reason being it was American 110 volt wiring and by using the converter to be able to plug it in and with Australia 240volt power the mirror caught fire. The seller won't say anything or tell you anything if the mirror is incorrect for you. It is just another automated sale well it looked cheap that's why I bought it!!! We can't warn you enough please ask the question is it a 240volt powered mirror? Be aware Amazon do a lot of advertising and now promote they can deliver to Australia however a great deal of their products are not set up for Australian 240 volt power. If you can't pick up the phone and ask a question or email and don't get a reply then try somewhere else. It's your best protection. Moving along we notice a number of manufacturers in China have closed down giving an insight into the industry. We were advised not to worry they will start up again under another name somewhere else. During the month we found a new model magnifying mirror that possibly could have been a great seller here in Australia. Dealing with the manufacture we know why they are closing down. This manufacture was not prepared to make or send us samples to evaluate and the minimum order quantity was 40,000 units. After much discussion we walked way which we guess is what others are doing. It's just not worth outlaying that kind of money to see if it will sell. Just a sign of the times we guess. I'll come back to your shortly with details as the stock lands.